Understanding the magnetic fields of planets is important for understanding how they interact with the rest of the cosmic bodies around them. Now, scientists have developed a new method that allows them to estimate the magnetic field of a distant exoplanet, telling them a bit more about the planet outside of the solar system. Scientists using the Hubble Space Telescope were thrilled to catch a view of the Jupiter-sized exoplanet HD 209454b as it passed across the face of its parent star, relative to the observatory’s line of sight. But what they found left them puzzled: a strange, asymmetrical pattern of highly charged hydrogen atoms moving quickly away from the star. Planet HD 209458b (Osiris) is a hot Jupiter, approximately one third larger and lighter than Jupiter. It is a hot gaseous giant orbiting very close to the host star HD 209458. HD 209458b accomplishes one revolution around the host star for only 3.5 Earth days. It has been known to astronomers for a long time and is relatively well studied. In particular, it is the first planet where the atmosphere was detected. Therefore, for many scientists it has become a model object for the development of their hypotheses. Scientist analyze the spectrum of light from HD 209458b as it passed in front of its star. 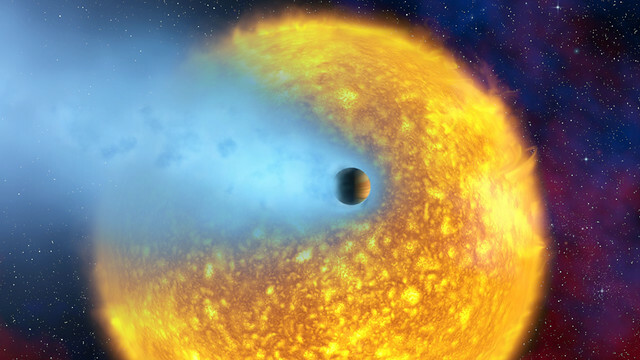 The data revealed hydrogen atoms moving away extremely quickly from the exoplanet in a lopsided manner. In order to investigate the bizarre way in which the hydrogen is blowing off HD 209458b, the scientists built a 3-D model. The model was manufactured to account for all the known interactions between planetary atmospheres and stellar winds, the flow of particles that stream off stars. The model suggested the exoplanet had a magnetic field about 10% as strong as Jupiter’s, and that the stellar wind was blowing at about 895,000 mph (1.44 million km/h). “This is the first time an exoplanetary magnetic field has been determined from Lyman-alpha lines,” said Kristina Kislyakova of the Space Research Institute of the Austrian Academy of Sciences. As well as providing an insight into other planets’ magnetic fields, the technique could also be used to study the solar winds on stars other than the Sun. However, it can only be deployed for “transiting” planets, i.e. those that move in front of their star from our perspective. The findings could also provide clues about the likely future of HD 209458b, and, in particular, might allow scientists to pinpoint which planets are most likely to harbor life.